As part of our aquatic ecology and fisheries service, our specialists provide bespoke and cost-effective monitoring for freshwater, transitional and marine ecosystems. We combine the data from our innovative and state-of-the-art monitoring equipment with our assessment and interpretation experience to provide clients with a greater insight into potential environmental impacts of proposed development schemes on aquatic habitats and species. 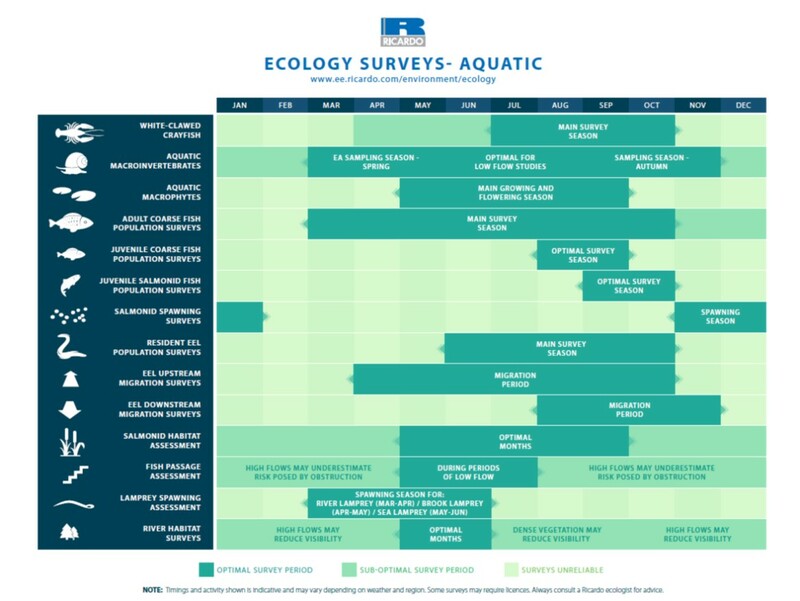 We are pleased to provide the complimentary Ricardo Ecological Surveys Calendar, which covers most surveys in both terrestrial and aquatic environments. Click here to download. Our experts have a long track record of providing pragmatic solutions to support the development of mitigation measures, and demonstrate success and compliance of projects. Members of our ecology team belong to a number of professional bodies including the Chartered Institute of Ecology and Environmental Management (CIEEM), the Institute of Fisheries Management (IFM), Freshwater Biological Association (FBA) and the Marine Biological Association (MBA) and, as such, follow best practice guidelines. Every team member has undergone water safety training and follows strict biosecurity measures. Ecological walkovers to support initial assessment of risk. Fish habitat surveys (including HABSCORE). Freshwater and estuarine fish surveys – using a range of techniques. Aquatic macroinvertebrate surveys and identification. Marine environmental baseline surveys for macroinvertebrates, macroalgae and habitats. Continuous and spot water-quality sampling. Macrophyte, diatom, phytoplankton and blue-green algae surveys. 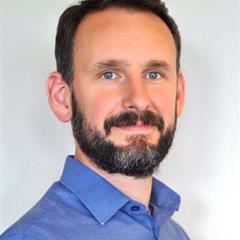 Ecological impact assessments (EcIA), habitats regulations assessments (HRA) and Water Framework Directive (WFD) assessments. Coastal and offshore fish surveys. Benthic video and stills analysis. Our staff hold protected species licences for white-clawed crayfish, otter and water vole and are able to provide clients with solutions and mitigation measures to support you in maintaining compliance, whilst safeguarding biodiversity. Our ecology team develops Construction Environmental Management Plans (CEMP), produces or reviews Environmental Management Plans (EMP) and provides on-site Ecological Clerk of Works (ECoW) services for projects that require the provision of toolbox talks and/or onsite supervision to enable works to proceed without contravening relevant wildlife legislation. Some members of our ecology team hold Construction Skills Certification Scheme (CSCS) cards. With leading experts in river restoration and fisheries, we are able to identify and evaluate barriers to fish migration on a catchment-wide scale. Our staff are experienced in undertaking river walkovers, feasibility studies, fluvial and geomorphological assessments and audits, habitat enhancement, ecological assessments and hydromorphological studies.